About mid-morning yesterday, I heard that the Ecuadorian police and/or military had seized and closed the Quito and Guayaquil airports. Todd had gone into Montanita for his favorite encebollado breakfast, and I was working on-line from our Casa del Sol rental room in my jammies. Reports started coming in from Facebook friends and expat forum acquaintances about the somewhat alarming news that civil police were striking and a political coup was underway. A couple of friends in Guayaquil wrote to say that they, along with most everyone else in the city, were pulling kids from school, shunning bus transportation (unfortunately an all too common place to be robbed in Guayaquil), stocking up on several weeks of basics, and staying home. A few others were reporting of incidents of opportunistic looting in the larger cities. 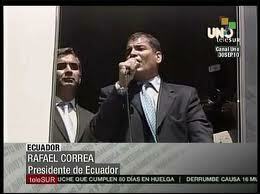 Some were saying that President Correa had been shot, the internet would go out, and a bank run was possible. Our friend Karen Kimbler said the scene in Cuenca was "rather quiet" with a few demonstrations in favor of Correa and the police were striking there too. She also said some stores had closed down. See more on her blog: Kimbler´s Exit to Ecuador. When Todd returned shortly later from Montanita, he was also aware of the situation, but said that most TV’s in town were tuned to the futbol (soccer) games rather than the news about the events in Quito and some of the larger cities (police striking in reaction to their recently implemented pay-scale restructuring, perhaps with some support within the national military) and President Correa’s rather dramatic response to it. Nothing was amiss or unusual in our neck of the woods. And since our l ocal police were still on the job, we weren’t sure if they even heard, knew, or cared that their big-city brethren were on strike. We called Randy in Jardines, and he said things were quiet and “as usual” in Olon as well. Without exception, every single local person we questioned yesterday about the events in Quito answered with a shrug and comments along the line of… “This is Ecuador”…. “these things happen” … “tomorrow will be different”. We returned later yesterday afternoon to Montanita to get a bite to eat and watch the news. Once again, the area locals seemed pretty much nonplussed by the activity happening in the cities, but we are concerned about the airport situation, given the impact it may have on some of our October guests and friends soon to be arriving. Not to minimize events in Quito – tragically resulting in several fatalities, we now know – but the impact along the coast has been nearly nada. The only two screens in Montanita that are tuned to the news rather than futbol are broadcasting from the same Ecuadorian news channel. Which means that Todd and I are essentially absorbing visual impressions about this situation, since we only understand about every tenth word, when we can hear it over Bob Marley and the soccer enthusiasts. Naturally we have been on the internet and we think that, as usual, most of the main stream media (here & States) TV broadcasts and internet news has been sensationalized, slanted, or sterile. From our perspective, the reality is that the travel warnings out of Europe now (based on recent terror threats) are more dire than anything happening here, and our airports are back open. We spent most of today writing reassuring emails to family, friends, and guests. The weather has been stunning for the last couple of days; all is tranquillo here. We’ve spent a lot of time puttering around the Montanita point tide pools, just poking around and gathering interesting shells and rocks. The political turmoil in Quito seems very far removed from us, and tonight Todd had a Montanita friend of ours come over and teach us how to make encebollado in Casa del Sol´s kitchen and we invited friends to join us for dinner (though this is generally a breakfast soup). 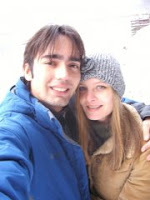 For additional perspectives about the attempted Ecuadorian coup of September 30, 2010, refer to Mary Beckman´s excellent site South of Zero which has a "daily news report of what’s going on in the Ecuador Expat blogosphere" and a comprehensive list of blogs and other helpful website links. I enjoy reading many of these blogs but I suppose my favorite comments about this event were made by Clarke of Clarke and Brenda...Next Stage (I think I have linked this to go directly to that post). After just a couple of days at Casa del Sol, Todd and I feel like we are on a holiday(taking a “vacation” from our “vacation”).The atmospherehere is relaxed, yet industrious. It’s the slow season and TJ & Jeff are taking advantage of this time to improve the property. The beach bar is undergoing an imaginative renovation and rooms and gardens are being upgraded. Whitney’s Yoga studio is ready. Our room (Room 10—on third floor in the back, is spacious and comfortable, has a killer hot shower, and best of all, WIFI that is reliable and fast). Because it is the low season, Todd and I are virtually the only ones staying here, and we have TJ’s & Jeff’s permission (Whitney is currently in the States) to store food and cook occasionally in the commercial grade kitchen for the next 3 weeks, which I suspect Todd can’t wait to utilize – he loves to cook, and he’s a dang good one. Which is a blessing, since my cooking skills leave a lot to be desired. Casa del Sol is a 5-7 minute beach walk north from Montanita (about the same time it takes to walk along the road – Ruta del Sol – if you don’t mind dodging the drivers, especially after dark). It is close enough to Montanita to feel the vibe, yet far enough away to hear nothing but the waves, a few crackling beach fires, and occasional fireworks. Oh, and maybe few bongo drums now and then. This place abounds with charm and kitties. TJ and Whitney fixed the youngsters, and are looking for a few good homes, but I suspect these adorable and affectionate cats are here to stay. We each have our favorites. My favorite is “Tingo”, and Todd’s is “Free”. We think “Monkey” is the mother; they’ve been named after well known surfers. All of them are trying their best to barge in our room for affection, and we are trying our best to honor TJ & Whitney’s request not to let them in, but it’s tough since they are so lovey. “Cacique” (Ca-see-kay – also the name of a colorful black and yellow local bird) is the resident dog who loves to fetch heavy 2x4’s and 5-pound bricks and is friendly and protective with those he knows. This is a mellow barrio – a laid back and relaxed neighborhood, with a shady tree-lined main road and several unique hostels, and we are totaling digging the atmosphere. We’ve been taking pleasant beach walks to Montanita for meals and savoring the slow season in town. In another couple of months when high season is in gear, this little village throbs with people, music, venders and street entertainers, but for now, all is quiet and calm in Montanita. Sure, Bob Marley still serenades and Ecuadorian techno music still booms from bars and restaurants, but the vibe is friendly and familial. Kids play on the street at night, lovers stroll along the beach, and without the distraction of tourists, the locals are chatty and affable. Todd and I are enjoying this time to get to know our local friends better, and scout out the less touristy places to eat in Montanita. We are really liking a new little pizza place on the side street across from Hola Ola, called La Leona Guason which is conveniently open most days as well as nights. We’ve also discovered a couple of street stands that sell tasty “Sanduche de Loma” (similar to a Philly Steak sandwich – I have mine without the fried egg and large corn kernels) for $1.50. Several street stands also sell thin hamburgers that are just okay, but at a $1.50 each, cheaper than the restaurants’ $6-8 burgers. On weekends, Montanita is still pretty lively, with many in the crowd gathered along the cocktail stands on “Bar Alley”, the northern most east/west street in Montanita proper. It also known as “Whiskey Road”/"Whiskey Alley"/“Cocktail Lane” and grown-up drink vendors line both sides of the street, each with a few plastic chairs and maybe a table or two to accommodate customers. They all offer potent, imaginatively named, and generally fruity concoctions for around $2-3. It’s a cheap and fun place to party, and filled with wall to wall people during the busy season, but now we have our pick of spots. Our favorite watering hole is “Galán’s”, on the north side of the road, a short left at the end of the main drag. Galán is a friendly and fun guy who makes a mean drink (I think our neighbor Randy was the first to discover him), and we all drink there now whenever we go to Bar Alley. Sitting on a balcony terrace overlooking Montanita tonight, I was thinking how very blessed Todd and I are now – even if this last year’s path getting here was grim and trying at times, especially during our “sell everything” phase. We are in a bit of a nomadic chapter now, which is a little uncomfortable for a nester like me, but both Todd and I feel like we are experiencing an exciting time to be living on the coast of Ecuador, integrating with and enjoying the local community(s), and grateful to be exposed on a daily basis to this wonderfully diverse culture and landscape. Both Todd and I hit the ground running today. He left at 5:00AM to catch the bus to Guayaquil and I was busy scurrying around the house doing last minute guest preparations, and moving our stuff to Casa del Sol for the next 3 weeks. Later in the morning Bobby came roaring into the compound to announce that our neighbor Juan had died. Fonda came over to tell me the news around 10AM. Juan and Lydia are local neighbors of ours, and could always be seen sitting outside their casa together – a sweet older couple who for the last 3 years have been reliably kind and friendly to us. They were always together, and we never saw one without the other, so my heart ached for Lydia. As the day wore on, awnings and chairs were set up in front of their house as friends and family of Lydia began holding vigil (a custom we have begun to notice*). Others were gathered inside. I walked over late this afternoon to pay my respects. I was looking for Lydia, and drifted inside the house in my pursuit. Once inside, I felt somewhat obligated to join the contingent there (there were around 20 people – mostly women and children – gathered in the front room and another clutch of women huddled in the back room. Most of the men were outside under the canopy sharing a bottle). Juan’s body was laid on a bed in the living room still hooked up to improvised I.V. stuff. It was very solemn, and very sad. About 15 plastic chairs had been hastily set up around, and I sat in one and paid my respects to him…I wasn’t really sure if it was proper for me to be there at all, so my plan was to quickly find Lydia and give her my condolences about Juan’s death and beat a hasty retreat. As I discreetly scanned the two rooms with peripheral vision looking for her, a movement caught the corner of my eye….I shifted my glance in that direction and saw……Juan take a deep breath. How I didn’t shriek and fall backwards off my plastic chair, I will never know. I thought I was looking at a dead person. 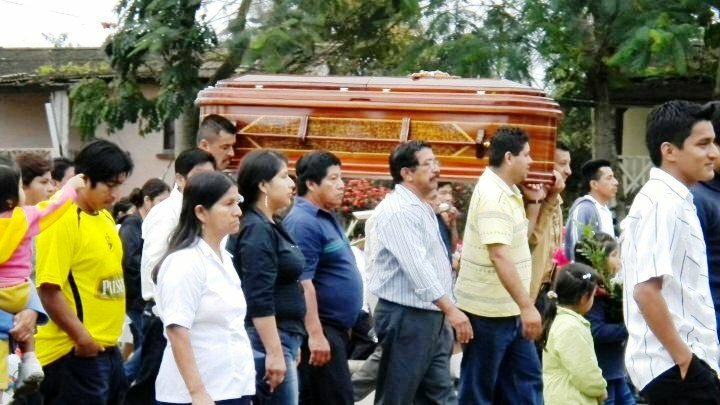 Juan was being kept alive on life support until funeral arrangements could be finalized (Ecuadorian law requires that bodies are buried within a time frame – I believe that is still 24 hours after death). Bobby neglected to mention that Juan was “brain” dead during his big broadcast this morning, and Fonda and I both scolded him later for omitting this little detail before I nearly had the living daylights scared out of me. Tonight, we are comfortably settled into our spacious room at the Casa del Sol; we shared a couple of beers and shots of “cana” (a wickedly deceptive sugar cane liquor, I think) with TJ this evening, and have called it a day. It´s been a long one. * We now know that the disembodied voices coming from the town´s loudspeakers originate from the "communa" (city council, for lack of better word) building, and announcements accompanied by the “El Condor Pasa” tune (popularized by Simon and Garfunkel on their¨"Bridge over Troubled Waters" album) indicate that someone has died and donations ($1-5 generally) are being solicited for the bereaved family. Thursday night while Randy, Fonda, Todd and I were enjoying a few beers on the patio, we heard quite a commotion going on in town. Fonda and I went to investigate and stumbled onto a bus parade making its way through town after dark. I counted at least 17 Citiup buses driving around our side streets honking their horns, accompanied by several police cars intermittently sounding their sirens. Most of the buses were empty, but a few had passengers. Fonda and I got quite a kick out of it, and also a giggle wondering if the passengers were just as confused as we were about why they ended up in a bus parade detour through Olon at 8:00 at night. Then yesterday I noticed that our little town of Olon was taking great pains to get spiffed up. When I asked Anna at Cyber Olon about it, she told me that the weekend festivities were sponsored by the local tourism bureau to promote our coastal towns and that some sort of celebration was scheduled in our soccer field this weekend. Not long after that, I noticed local cleanup crews of men and women at the beach and soccer field wearing attractive “Limpienza de la Playa” logoed tee-shirts (I suppose there were at least 30 on the beach crew I saw). Later in the day, Fonda and I ran some errands in Montanita. I sure do enjoy my time with her….both she and Randy are down to earth people with a great sense of humor. We cruised Olon on our way home to scout out the activity. According to Fonda, who got it from Oswaldo, we understood there may be food booths set up on the soccer fields sometime this weekend. And sure enough, today in the soccer field a number of food and artisan stands were set up for a “Feria de Turismo” (Tourism Fair). Each of the neighboring coastal towns (Montanita, Valdivia, La Entrada, Manglaralto, Dos Mangos, etc) had booths selling or displaying artwork, jewelry, artifacts, food, and information about their pueblo. A number of area artisans also had set up tents to display their wares. Local dancers from each village entertained the crowd in front of what appeared to be a judges’ stand. A long banquet table was set up in the middle of the field; six local towns entered plates of “comida típica” (typical food representing their area) for judging. Olon’s entry into the food contest was under a separate tent – a huge 12x5 foot dish of rice and assorted seafood and vegetables that was later served free along with samples of a sponsor’s soy sauce and baseball caps. All in all, it was a great event and Todd and I think the folks in charge of promoting tourism along our area of the coast have a wise vision and are doing a bang up job. We only have a couple of more days in our house before our next guests arrive – the Millers from Illinois, followed by Diane and Armand from Louisiana (they also live part of the year in Argentina). Todd and I are looking forward to spending the next three weeks at Casa del Sol, a hostel just north of Montanita. The proprietors, TJ and Whitney, and Jeff are friends of ours. It seems we dodged a bullet with Daisy, who fortunately is not pregnant –though we are pretty peeved with Dr. Wilmer (pronounced "Veel-mir"), whose sterilization procedure apparently amounted to nothing more than tying her tubes. My baby is having a baby. Taco Bell, Where Art Thou? Plants thrive in the climate and soil of Ecuador – even in the sandy dirt along our coast. Ecuador is the world’s largest exporter of bananas, grows some of its best coffee, and is lush beyond belief. …The colorful cut flowers (especially roses) that you buy in the States? They probably came from Ecuador. Please support our economy here, and splurge now and then on their beauty. In our yard we have papaya, banana, and noni trees. Though the smell of a ripe noni is awful, it has been highly touted – especially by Japanese researchers – as having valuable medicinal/anti-cancer properties. Those who regularly drink the fresh juice recommend mixing it with another juice or beverage (make mine a vodka – I’m telling you, these things smell terrible). We also have poinsettias growing in our yard that are taller than me; until we came here, I didn’t know they grew bigger than the foil-wrapped holiday version in the States….I’ve seen our caretaker, Oswaldo, transfer various broken plant branches (not the roots, mind you) into soil and watched them bloom into sturdy offspring. I honestly think a broom handle could be planted and little straws would sprout. Seafood is also abundant. Fresh off-the-boat shrimp, langostinos (really big shrimp), squid, octopus (pulpo), crab, lobster, and any variety of fish are readily available. This is a seafood lover’s paradise. And the diversity of fruit and vegetables available here is astounding (many unfamiliar to North Americans), not to mention the size of the produce – cabbages are the size of basketballs and cucumbers grow to 2 feet long and are thicker than my calves. Todd thought they tasted like "dirt". So at the risk of sounding churlish, I am bored with the food at this juncture. Todd loves the comida here, but he is a more adventurous eater than I am (I have always been picky, and sincerely wish I wasn’t) and he has found a restaurant in Montanita that serves excellent encebollado (a fish soup that is commonly eaten for breakfast) and another in Montanita that offers papas huancaina, a favorite Peruvian potato dish he enjoys. Fresh, wholesome food is plentiful and lunch is generally the big meal of the day. Rice and beans are served with every meal, along with fried plantains (patacones), which I put right up there with lima beans as far as flavor (these things beg for some type of tasty dip yet to be discovered by me). It’s not that I’m starving, but gnawing hunger cravings constantly bother me now, though I knew this would happen – it always does by month two or three, and I knew to expect it. I’ve always been able to forge past this phase – because it does pass – once I adjust my personal expectations of an Ecuadorian meal that really excites me. But in the past, I also knew that an In&Out burger or Taco Bell burrito was readily available in my near future, upon returning to LAX. I confess that I am a junk food addict. I have eaten – and thrived – for years on crap food – pizza, Diet Cokes, Velveeta Cheese and frozen chow. NEVER in my life have I slapped my forehead and said “gee, I really want a piece of fruit”, nor willingly eaten a green vegetable, and I have always considered Nacho Doritos a perfectly natural substitute for “orange” food requirements. That, and I am originally a Kansas City girl (though I have lived in Nevada or California for the last 30+ years). Which means…..I NEED MEAT (beef or pork) and BUTTER and BACON on a regular basis. I would crawl on my elbows right now for the nearest package of Jimmy Dean sausage. Not to mention a Kansas City “Winstead’s” meal. Fortunately, real butter is easily found locally most of the time…The gringo craving that most tortures me at the moment is for authentic MEXICAN food, like we have always taken for granted in Southern California and Baja Mexico. In a Montanita restaurant tonight, my poor shrunken/deprived tummy craved something Norte Americano, so I ordered a grilled cheese sandwich & french fries, mustard/mustazo on the side. (Note to self - learn how to say “pickles” in Espanol, even though no local restaurant stocks them)….Grilled cheese sandwich - I mean, how safe can you get, even without the pickles? When it was served….on a cold, soft, thick sesame seeded hamburger bun with thin layer of melted white cheese in the middle - not sharp yellow cheddar – a few slices of raw red onion, and a fried egg (eggs, in one form or another will invariably turn up in most sandwiches /dishes you order here unless you tell them otherwise). I very nearly lost it. It’s all I could do not to cry, because if I’m not exactly starving at this point, I am tired of eating eggs, canned tuna and/or beans and chicken for my current protein fix. But I have also lost a few unneeded pounds,feel like a million bucks, and becoming more tranquillo. Like I said, everything grows here, and Todd and I are growing too – but not without an occasional pruning. "La Putanita de la noche¨"
(The "little whore of the night"